Wim Wenders has made several unforgettable documentaries. The best have been about kinetic topics, most notably music (Buena Vista Social Club) and dance (Pina). 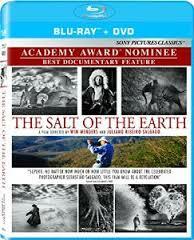 The Oscar-nominated feature The Salt of the Earth, available in a Blu-ray/DVD combo package, is very different from those “action” documentaries in that it concerns the work of noted Brazilian photographer Sebastião Salgado. As such, it winds up being about memory (as all studies of photography are) and very serious social issues. The film is a mixture of dreaminess and dogma. The dreamy aspect is the most appealing, as it allows us to “get lost” in Salgado’s stark b&w photos. The side of the film that deals with social issues is deeply felt by Wenders and his collaborators, but it is somewhat undercut by the dreamlike tone and the movement from one social dilemma to the next. 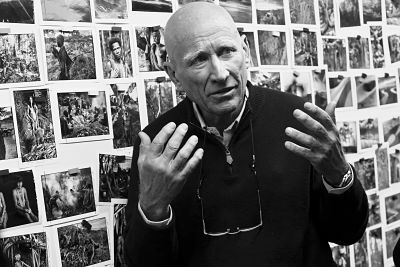 The different levels on which the film operates are the result of Salt having three narrators, each of whom comes to Salgado’s work from a different angle. The first is Salgado himself, who offers his life story and what he was thinking when he shot the photos we’re seeing. The second is his son Juliano, who co-directed the film and presents a heroic portrait of his father, while also noting how little he saw of him as a child. The third is Wenders, who offers his perspective on the photo sets and establishes the chronology of events. Thus we view Salgado’s extremely stirring work from several different viewpoints when one might have sufficed. Juliano’s tales of working with his dad on photographic shoots could have been sacrificed, since the most salient “plot line” here is how Sebastião decided to explore major themes (refugees, work, etc) by flying from country to country and immersing himself in the cultures he encountered. His photos range from picturesque to deeply disturbing — his images of the Rwandan genocide in particular offer horrors reminiscent of the Holocaust. 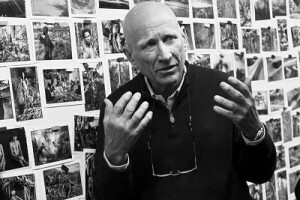 One can well understand the transformation seen in the film’s “third act,” in which Salgado reveals that he was so deeply disturbed by the atrocities he had seen and photographed that he quit journalistic photography for good to pursue an ambitious project: replanting trees in an agriculturally gutted part of Brazil owned by his family. The ensuing reclamation project is nothing short of inspiring and lends an upbeat conclusion to the picture. Curiously, this part of the picture (in color, with no photographs) leaves perhaps the most vivid memories in the mind of the viewer. Wenders’ pure approach to spotlighting Salgado’s photos deserves much praise, as he doesn’t adopt the all-too-ubiquitous “breathing photographs ” technique that has become de rigueur in documentaries over the last decade or so (think The Kid Stays in the Picture). Unfortunately, he also veers away from the sublime cinematic editing of photos practiced by his friend, the late master filmmaker Chris Marker (whom Wenders encountered onscreen in his docu Tokyo-Ga). Marker’s excellent Remembrance of Things to Come (2003) is quite similar to Salt of the Earth, in that both films summarize a photographer’s life and the photographer’s adult children served as co-directors (the photographer was deceased in the case of Marker’s essay-docu). Salt demonstrates that Wenders is still blissfully capable of crafting a very eloquent tribute to a friend’s work (something he first did in 1980 with Lightning Over Water, his homage to Nicholas Ray). One hopes he gets his long-deserved Oscar a few decades before he qualifies for the Lifetime Achievement award. One of the nicer surprises in the package is that yellow subtitles are used for the English translation of the film. Although most DVD labels eschew colored subs, they truly are the only way to not miss a line in a b&w feature. Sony’s laudable decision in that area is counterbalanced by the regrettable decision to include the three bonus supplements only on the Blu-ray disc and not the DVD, where there clearly is ample space for them.